I believe that the techniques that you use to maintain your protective styles are very important, but I also believe that choosing the best products for your hair during this time is valuable as well. Especially because you most likely have little to no access to your hair, and therefore, are unable to truly evaluate how your hair is reacting to the products. If things are going well, you're in great shape, but if they're not - fast forward six plus weeks and you may be in for trouble. 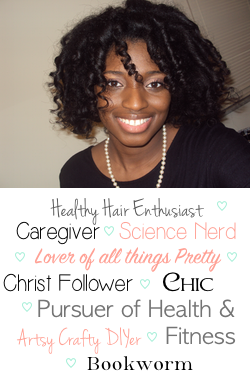 This is my list of "brief" reviews of all the products I used whille protective styling with box braids. I purchased 6 products and made two of my own. I found all of them at my local beauty supply stores for about $3-6 each. There are websites listed in case you would like to check out the ingredients. There was only one product I didn't like at all, but everything else I used pretty much the entire six weeks of wearing this style. These are products that helped make my protective styling very successful and many of them I picked up based on the reviews of others on blogs, YouTube and people I know personally. So, while there is always a chance that some of these may not work as well for you, I think it's safe to say that a number of these products are pretty popular among healthy-haired ladies while protective styling. My experience: This braid spray was awesome! It smells really good, doesn't leave a sticky feeling or film behind, and does a great job moisturizing my hair. I used it every other day and sometimes daily. I also diluted it some with water (3:1 ratio) after awhile and still loved the way it treated my hair. I did this for two reasons: 1) I felt a lot of the product was going on my extensions (read: being wasted) and not just my actual hair, and 2) using it as frequently as I was, I wanted to make sure it lasted the duration of my style. My only complaint about this product was the packaging. It could have just been a fluke, but my pump was terrible. It spit all over me and dripped down my arm everytime I tried to use it. I ended up just transferring it to one of my own spray bottles... problem solved. My experience: This product, I felt, was my risky one. I've never tried any products from Mane 'N Tail, but I know people looove them. I think that was what made me comfortable with going for it. I wanted this spray to kind of balance my extreme use of moisturizing products. I am never this product heavy with my hair on a day-to-day basis, so, I was a little concerned with taking my braids out and dealing with moisture overload if I didn't add some kind strengthening/protein treatment in at times, too. I didn't use it as often as the braid spray, probably just a couple times a week. I like the way it smells, it wasn't sticky, and it didn't stiffen my hair. I think it worked well because when I took my hair down, it still felt pretty strong; like it wasn't weakened from the style. My experience: I've mentioned this product before because I bought it to keep my scalp clean while prolonging the time in between my wash days. It did exactly that. Initially, I was a little skeptical about it because it's gel-like, unlike the spray form of most salon brands I've read about, but it worked very well. It doesn't leave any kind of residue behind either. It's easy to use and there are several different ways you can use it to get clean your scalp, the length or your hair or both. It smells antiseptic, which isn't really surprising when you consider its ingredients and purpose. It pretty quick start to finish, too. I think a main difference between this and most salon brands is that it is formulated for braided, twisted and extension styles. That is why I chose it. A little goes a long way so I feel like I'm going to have this stuff forever. My experience: This is the one product I didn't like! It was so weird to me. When you spray it on, you do feel like the itchiness goes away almost immediately. But the problem is that that relief is very short-lived. Yes, I know you shouldn't expect too serious of a solution for itchiness from a spray, but it was like I would have had to spray this on hourly for continued relief. Once, maybe twice a day would have been fine, but never that frequently. Also, it left a weird filmy-like build up on my hair and scalp. It was a little sticky, too. So, this was just a fail for me. My experience: Loved it! This was a life saver! I tried so many different ways and used multiple scarves night after night to tie my hair up before I got this. My scarf would either fall off or my braids would fall out of it before the night was over. This bonnet made it so easy to just put all that long hair right into it like a sack. Then you just tie it up in the front or back. It worked wonderfully. I also made an oil mix to apply to my scalp and a moisturizing mix to give my hair an extra boost when I felt I needed it. You can read about how I did those here and here. They both worked great for me. Of course, you can always use the oils and conditioners of your choice. Have you used any of these products? Let me know how they worked for you! I don't have braids but I think that i'd definitely give that Satin braid bonnet a twirl when I don't want to loose volume in my air dried hair. Thanks for the tip! Great idea KLP! Never thought about using it that way. Let me know how it goes if you do end up trying that out. I am soon getting my hair done into box braids and this is my first time. I have been doing my research for tips on how to maintain box braids, I love that this page because it mentions affordable products and gives a very descriptive personal experience. So I will purchase all of the products you've mentioned and try them out. Super excited to try them out! Thank you so much this really helped! What are the best hair products to use while putting braids in your hair? I am doing a mohawk braid and I don't know what hair products will help keep it from messing the braids up.